President Bush won't comment directly about allegations he authorized a top White House official to leak intelligence on Iraq in 2003. But, the president told an audience in Washington today he declassified part of a prewar intelligence report so Americans could "see the truth." Mr. Bush says after the U.S. invasion, there were "questions in people's minds," so he decided to free up the information. In court filings last week, prosecutors say Vice President Cheney's former chief of staff told a grand jury he was authorized by Mr. Bush, through Cheney, to leak part of a classified document. The National Intelligence Estimate detailed the government's conclusions about Iraqi weapons of mass destruction. Lewis Libby faces trial on charges of perjury and obstruction of justice for alleged lies to a grand jury and officials investigating the leak of a CIA agent's identity. Earlier, a leading Republican senator said Mr. Bush and Cheney should speak publicly about their involvement in the CIA leak case so people can understand what happened. "We ought to get to the bottom of it so it can be evaluated, again, by the American people," Sen. Arlen Specter, chairman of the Senate Judiciary Committee, said Sunday. In a federal court filing last week, the prosecutor in the case said Libby, testified before a grand jury that he was authorized by Mr. Bush, through Cheney, to leak information from a classified document that detailed intelligence agencies' conclusions about weapons of mass destruction in Iraq. A lawyer knowledgeable about the case said Saturday that Mr. Bush declassified sensitive intelligence in 2003 and authorized its public disclosure to rebut Iraq war critics, but he did not specifically direct that Libby be the one to disseminate the information. "I think that it is necessary for the president and vice president to tell the American people exactly what happened," Specter told "Fox News Sunday." Specter, R-Pa., did not dispute the White House claim that the president has the power to declassify secrets, reports CBS News correspondent Peter Maer. "I do say that there's been enough of a showing here with what's been filed of record in court that the president of the United States owes a specific explanation to the American people ... about exactly what he did," Specter said. "The president may be entirely in the clear, and it may turn out that he had the authority to make the disclosures which were made," Specter said. But, he added, "It was not the right way to go about it because we ought not to have leaks in government." Sen. John Kerry, the Democrat who ran against Bush for president in 2004, said it was wrong for Bush to declassify information selectively "in order to buttress phony arguments to go to war" and to attack people politically. "This was not a declassification in order to really educate America. This was a declassification in order to mislead America," Kerry said on "Meet the Press" on NBC. "I think it's a disgrace." 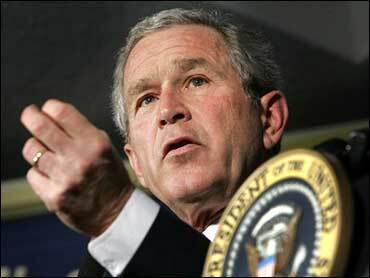 Wilson said Sunday that Mr. Bush and Cheney should release transcripts of their interviews with Fitzgerald. The lawyer knowledgeable about the case said Mr. Bush instructed Cheney to "get it out" and left the details about disseminating the intelligence to him. The lawyer, who spoke on condition of anonymity because of the sensitivity of the case for the White House, said Cheney chose Libby and communicated the president's wishes to his then-top aide. "I don't think there's any evidence that the president told the vice president to go leak information to the press," said Sen. John Kyl, R-Ariz.
Kyl said on CNN's "Late Edition" that a better way for the administration to have tried to counter Wilson's claims in a New York Times op-ed would have been to "have all of the press be given" the declassified intelligence material. It is not known when the conversation between Mr. Bush and Cheney took place. The White House has declined to provide the date when the president used his authority to declassify the portions of the October 2002 National Intelligence Estimate.